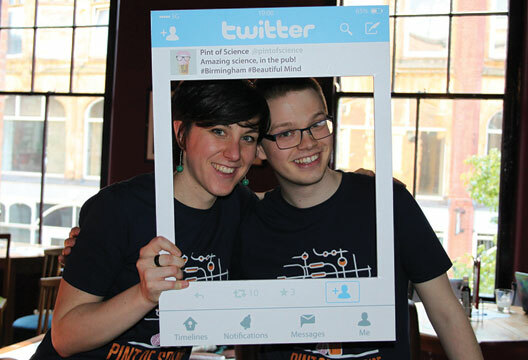 Across three evenings pubs in the UK, Ireland, France, Italy, the USA, Spain, Germany, Brazil, Australia, Canada, Austria and South Africa, simultaneously held Pint of Science talks. Four academics from the University of Birmingham took to the stage during this year’s festival to speak about unhelpful chimps, mind-reading, consciousness and movement in autism. Our reporter Ella Rhodes was there. Can chimps really be helpful? Dr Claudio Tennie kicked off the Birmingham ‘Beautiful Minds’ stream of the festival by examining some claims that have captured the imagination of people across the world. We can see why competition, what Tennie called ‘the opposite of helping’, has evolved – in the face of limited resources it makes sense to strive for survival. But helping is another matter entirely: why would animals do anything for another at his or her own cost? Around 10 years ago in a laboratory setting Brian Hare captured video of apparent helping. He had dropped a piece of wood inside a chimp’s cage which he couldn’t reach, and a chimp grabbed the wood and handed it back. Tennie said that without a control condition, Hare may have over-interpreted this behaviour. He pointed out that captive chimps are often trained to fetch and are rewarded for doing so. Hare was also banging on the side of the cage to get the chimp’s attention – the chimp may have fetched the wood to stop the annoying noise. Professor Ian Apperly set out to convince the audience they were all mind-readers and pointed to proof that we engage all the time with what’s in the heads of other people. Autism and schizophrenia may provide us with some clues – both have a deficiency in perspective-taking. Apperly said it is interesting to see where people fit on a continuum of clinical conditions such as these. In one paradigm participants carried out a computer task where they saw a shelving unit and an avatar standing behind it who asks them to move objects around, for example ‘Move the biggest hairbrush up’. However, crucially, the avatar cannot see all the shelves so participants have to take her perspective into consideration. Adults can still make errors on this task, and Apperly has found the high-autism-traits and high-psychosis-traits groups make more errors. Interestingly, people who are high in both do not make as many errors – although Apperly said it’s unclear why this happens. But how do we even do perspective-taking in the first place? People who are very good at the shelf task have better working memory, and it seems to involve executive and inhibitory control. Apperly said that while perspective taking seems to be a slow process, there are some elements of it which are quite speedy. In another paradigm he designed, Apperly flashed up images of a person facing a wall side-on. Dots appeared on the wall in front and behind him, and participants simply had to answer how many dots they could see. However they were much slower at this if there was a dot behind the man – it seems as though people process the man’s visual perspective, which slows down the judgement of their own. Later in the Beautiful Minds section of the Pint of Science Festival, neuroscientist Dr Davinia Fernández-Espejo discussed her work with brain-injured people who, while appearing to be in a vegetative state, actually retain their consciousness [see also Adrian Owen’s work, http://tinyurl.com/grla4w5]. The areas in the brain responsible for movement are also involved when we imagine movement so, in an MRI scanner, this can be used to assess consciousness and ask patients simple yes or no questions. Fernández-Espejo explained that in the scanner she asks patients to imagine playing tennis and the corresponding motor regions will be active; she also asks them to imagine walking around a familiar place and assesses the brain areas that are active in this task. With one patient, who was in a vegetative state for 12 years unable to communicate with those around him, they used the above task to help him to answer questions. Using the activation patterns associated with each imagined movement they could clearly see in which direction he was answering, using this technique to discover that he was without pain and had been enjoying the hockey games his parents had been playing to him. In another study with patients she found a physical disruption in the fibres connecting the thalamus and motor cortex – explaining the inability these patients have transforming thoughts of movement to actual movement. The damage in these patients lies in connections rather than the whole brain stem. She said she and her team were able to identify a new syndrome, which at first is indistinguishable from a true vegetative state, and she hopes to be able to find something to restore some movement capabilities in these patients. Dr Jennifer Cook set the scene of her talk by describing how children with autism may have been treated in the 1930s. In those days they would usually be given a diagnosis of ‘mental retardation’ or ‘childhood schizophrenia’ and could be sent to asylums. However Hans Asperger, working in Vienna at the time, noticed many of the children he saw were not ‘retarded’ and did not develop schizophrenia in later life. A group of them showed similar characteristics – were overwhelmed by social situations and used language in an unusual way, they enjoyed logical rules and consistency and patterns. He called it autistic psychopathology. This symptomology is now well known, and doctors, Cook said, look for similar traits to this day. But how about the body movements of these children? Some work in her own lab required adults with autism and a control group to move their outstretched arm to the left and right horizontally with a flat palm. Each person wore a movement tracker, and Cook saw the control group showed a pattern where they started slowly, sped up in the middle and slowed down towards the end before they changed direction. This helps to minimise the jerk of the movement and keep it relatively smooth throughout the task. But those with autism quickly accelerated their movement then ‘slammed on the brakes’ before changing direction. It is unclear why people with autism might move in a jerkier fashion than others. As well as making fine motor tasks trickier, this difference in body movements may affect how people with ASD are perceived in general. As Cook pointed out, movements in a person’s body tell us much about how they are feeling or even what they’re thinking. In the 1970s Gunnar Johanssen asked whether it was body movements or facial expressions that told us about emotion. He had actors wear light bulbs on their clothes and filmed them moving in certain ways, as if happy or sad for example. He asked others to guess what emotions they were portraying from the patterns created by the lightbulbs, and people were very accurate. Perhaps people without autism, Cook suggested, find it harder to understand the feelings of people with autism because they move differently to the average person. In an experiment Cook asked people to move around two triangles on a whiteboard (using magnets underneath the whiteboard) to act out a ‘mocking’, ‘surprising’, ‘seducing’ or ‘coaxing’ movement from one triangle to another. New participants, without autism, watched the resulting videos and asked them to say on a scale of 1 to 10 how much it portrayed that scenario. When they saw videos made by non-autistic people, they were better at figuring out the scenario or emotion. Cook ended her fascinating talk with two suggestions: first, if we know a person with autism, we should be aware they may express their emotions differently with their bodies; second, a future direction of her work may be using an Xbox Kinect to train people to move like those with autism, which could potentially give some insight into their feelings.